Italian teachers and students, rejoice! 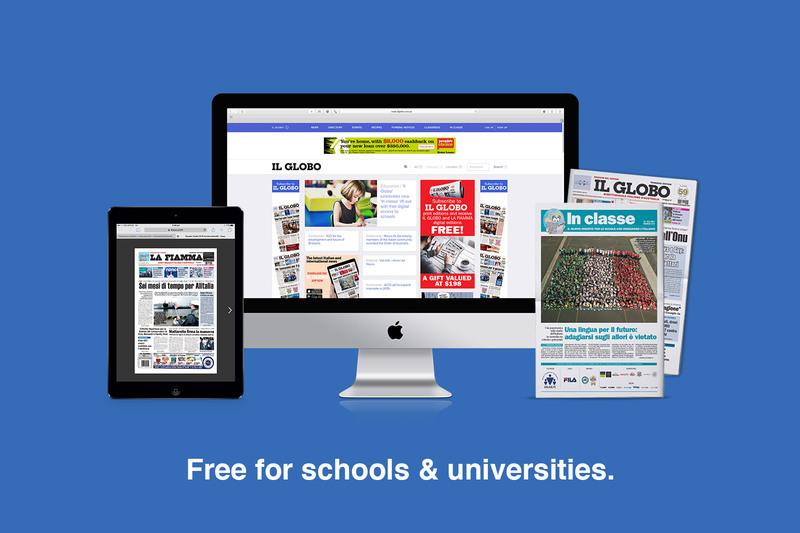 In 2019, schools and universities across Australia will be given unlimited free digital access to every edition of La Fiamma for staff and students. A staff member at your school just needs to take a minute to register, and all students and teachers will be able to use the pages of our papers as a starting point for classroom exercises and conversation, or to simply get their news fix in Italian. The initiative comes in the lead-up to the first edition of the new and improved version of In classe, which will now be a monthly lift-out with an abundance of content and information relevant to the education sector. The first edition of In classe will be published in this Thursday’s edition of La Fiamma. Editor of Il Globo and La Fiamma, Dario Nelli, described the initiative as a “new adventure which seeks to meet the needs of the community, as we have always done”. “This represents a new challenge for us and a new opportunity for those passionate about studying our language,” Nelli said. The first edition of the new In classe will feature an in-depth exploration of Italian studies across Australia by co-assistant editor of Il Globo and La Fiamma, and co-founder of In classe, Margherita Angelucci. Director of Education and Culture at the Embassy of Italy in Canberra, Anna Rita Tamponi, provided statistics showing that Australia has the second-highest number of Italian students after Italy. Despite this, there are many issues which need to be addressed when it comes to Italian studies in Australia. These include students’ lack of knowledge of the Italian culture, particularly contemporary culture, and the drastic decrease in students of Italian at a primary and secondary level. In classe aims to give a voice to those who are dedicated to the promotion of Italian in a scholastic setting, including teachers and principals who seek to introduce new and innovate ways of engaging students. The section entitled Insegnare is dedicated to teachers and professors who don’t “rest on their laurels”, from 2018 Unsung Hero in the Italian Teacher category, Franco Cudini, to senior lecturer of Italian Studies at Monash University, Francesco Ricatti, who gives an in-depth description of a course which sheds light on contemporary Italian literature. Each edition will also feature a space dedicated to students: the first edition will include news from the previous scholastic year, contributions from students of the Italian Bilingual School in Sydney, and an interview with two students who were among the VCE Top Scorers for Italian in 2018. In classe also aims to be a useful tool in classrooms across the nation. In collaboration with CO.AS.IT. in Sydney, the lift-out will feature two pages of exercises for Year 5 and 6 students, while older students can expand their vocabularies by reading a simplified news article. In classe will be managed and compiled by Il Globo journalist Sara Bavato, who has recognised a growing interest in Italian studies within our community throughout years of working on the publication’s local community pages. It was this interest which inspired Bavato in 2017 to establish a page entirely dedicated to schools that teach Italian. This week will mark an evolution in which one page becomes a lift-out bursting with news, photos, activities and information... and open to your contributions and feedback. For more information or to register, head to our website. To contribute, send us an email. This represents a new challenge for us and a new opportunity for those passionate about studying our language.